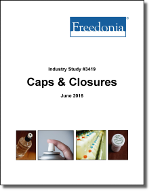 Demand for caps and closures in the US is expected to grow 4.2 percent per year to $11.8 billion in 2020 with value gains bolstered primarily by the growing use of high value dispensing and child-resistant closures (CRCs). A mitigating factor for value growth will be continued lightweighting, which drives down the costs of raw material and keeps prices low. Unit gains are expected to increase by 3.1 percent per year to 327.3 billion in 2020, driven by the adoption of smaller bottles in several beverage markets as well as a positive outlook for pharmaceuticals. Unit demand will also be aided by the use of caps and closures on previously closureless packaging formats, such as pouches and gabletop cartons. Unit gains will be held back by competition from closureless packaging, such as flexible formats and blister packs. Companies mentioned include Berry Plastics, Silgan, AptarGroup, Reynolds Group, WestRock, and Crown.